Description: Server application base programmed in C# to mimic GameMaker: Studio's Networking functionality. Tags: TUTORIAL, CSHARP, C#, GML, GMS, NETWORKING. This section is for examples made by the community for the community for helping get started with the SharpServer framework. Please do not claim any of the following works as your own. PseudoPacman by mystborn. An online multiplayer pacman. All examples I add--or if someone wishes to contribute--will be added to the GitHub repository as well as this post. So far, no examples yet! Re-write! I've redone everything to make the process of programming using my system a lot more bearable. However! The actual system itself has not changed fundamentally, it's simply been refined. remove the functions with their type in the name of the function, e.g. Writeu8, ReadStr, etc. calls these events when necessary, all you have to do is subscribe your own methods to these events to do what you want. sockets that pertain to any specific SocketBinder. PacketStream for sending via TCP and DataGramStream for sending via UDP. Both now provide SYNC and ASYNC send calls. IPServicer. You can now call the IPServicer to use supported web APIs to obtain your public IP address for whatever reason. Honestly though, not entirely needed since you don't need your public IP address to startup a server. Pretty cool nonetheless. include it since it requires account registration. to your machine. Naturally though, to connect a client globally you'll still need to connect via your public IP address. be thrown by a method. exceptions without prompting you for any errors that occurred, which is pretty bad. This no longer happens. Your errors, your problem. I have now included a method for restarting your server. Better alignment. Alignment is more efficient and correct using Mike Daily's fast alignment algorithm: "index + ( alignment - 1 ) & ~( alignment -1 );"
Of course though, I've done some pre-computing so that the (alignment - 1) and ~(alignment - 1) math happens before any of the alignment happens. CSServerGMS -> SharpServer (Namespace name). ByteBuffer.Send(Udp/TCP) -> SendAsync()/SendSync() -> PacketStream. * for TCP and DatagramStream. * for UDP. Added SocketContainer for actual sockets. The *Handler classes derive from this class. I won't be writing a new tutorial like for the old post. If you need a re-fresher read the old post and then get aligned with all the changes. Rekt, I um, accidentally deleted the old post when editing this, whoops. However I will be outlining all the major changes below to avoid frustration. Sockets used to be bound using SocketSystem by calling static methods-- no longer. Now you'll need to create an instance of SocketBinder. to see if it's still connected or if it disconnected. byte has no equivalent. Instead read out the number of bytes individually. This will write the specified value casted to a byte to the BufferStream. This will read the specified type from the buffer and store it in the indicated variable. The OUT modifier basically says: Take the reference to the passed variable and give it to the function. This lets the function give the variable the specified value by passing the value to the variable via it's reference. NOTE: Events are OPTIONAL. You can choose to use all none, or only a few events if you want. a default handler instead. ClientCreatedEvent is the only event with a default handler so far. This will apply your methods to each TCP server event. NOTE: The method names can be whatever you want. If you're curious--yes the += does mean you can subscribe multiple methods to one event. // This event is called AFTER the server starts and BEFORE the server begins accepting client connections. // This event is called to create a new client and MUST always return a new non-null client. // This event is called BEFORE the server finally closes. // This event is called AFTER the client is accepted and BEFORE the client starts receiving packets. // This event is called BEFORE the client finally is disconnected. // This event is called AFTER a packet is received by a client, so the packet can be processed. // This event is called AFTER a client timesout on the server and BEFORE the client's connection status is re-checked. // Generally you'd use this event to send a verification packet to the client to check the state of the client's connection. This will apply your methods to each UDP server event. // This event is called AFTER the server starts and before the server starts receiving packets. // This event is called AFTER a packet is received, so the packet can be processed. The cool part here is that you can write your entire server in a single CS file since you're no longer restricted by pre-defined fill in files. to the console when the server receives a packet from the client. to the output DLL file. source code as a DLL to your project. You can now reference the SharpServer namespace to access the server API. This is a small alternative to importing the actual source code into your project. On another note, I find it funny that this is easier to create a server with than in GameMaker: Studio! Edited by FatalSleep, 16 December 2015 - 01:16 AM. Honestly, I have no idea how much clarity the information above will have for strictly GML programmers or GML programmers of medium/low caliber. Nor do I. But one way to find out is to post this and see what discussion evolves. So let's see. Normally, we might not allow tutorials that contain significant non-GM portions. But I feel this deserves an exception since it supports (and relies upon) a specific GM application. I believe there are many members who want to set up their own servers to support their GM games, but need help doing so. Perhaps your example can help them. Awesome, thank you! I've done my very best to make this as easy to use as possible by pre-setting up everything that no one wants to mess with as well as perfectly matching GameMaker Studio's buffer system. It was quite difficult, but I am pretty sure I got everything right. If for some reason that my explanations did not help, I will clarify anything that was vaguely explained as well as answer any questions you guys might have. I'll definitely have a play around with this! Networking in proper programming languages always seems so scary and it looks like you've done a good job of making it easier for people like me to understand. Follow @GameMakerUpdate to get info about latest versions of GM when they are released: https://twitter.com/GameMakerUpdate or visit website. my project here will remove that intimidation and bring forth some good results. @Gnysek I could post it on Github, I actually originally planned to do it. Then forgot! EDIT: Update with GitHub link added to the original post. Edited by FatalSleep, 13 May 2014 - 09:35 PM. Perfect. Trust me though, you honestly do not want to do this from scratch. Good programming xp, but terrifyingly annoying to program! only learned a week ago about the beauty of null-terminated strings. To those that tried to use the Host-A links, my apologies, for now please use the GitHub repository until Host-A is back online. Having 1 thread per client looks like an overkill and probably is an overkill if your going to host many players at the same time. Possible, but Threads are far faster than using for loops to process clients. Besides, it was either threads or classes. Or do you know of a better way? :D I'm open to ideas! A better approach would be asynchronous events with pooled threads this way you'd be specifying 4 - 5 threads dedicated to handling 'all the players' evenly but like i said in a single core system threads don't matter so much and spawning 1 thread per client will bottleneck that cpu further and become far more efficient than if you had just sequentially processed them using a foreach. Anyway, i might release a more practical example until then hopefully these points can point you in the right direction good luck! You sure nodejs would be any better than C#? 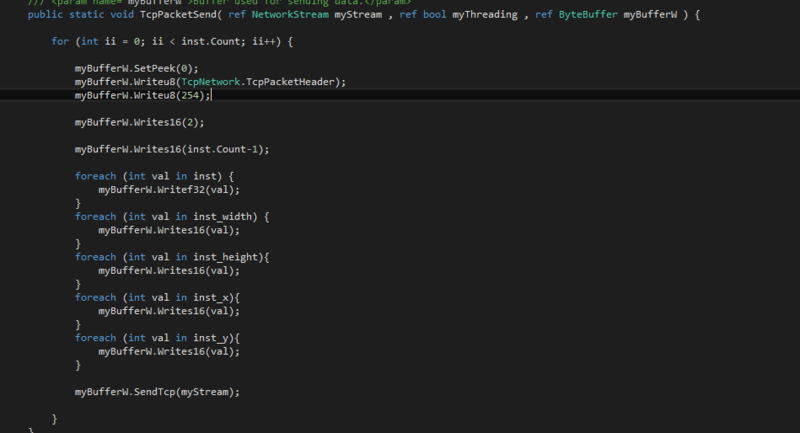 I don't see how it could if I'm using async events in C# just as I would in nodejs. I don't know though, I don't know much of nodejs. I'll look into your suggestions and adjust the server accordingly. I would do something like 1 thread per 10 players, it really depends on the type of server your creating and the code your doing. If your going to make a simple chess game then 1 thread per 50-100 players (maybe its to much or maybe to little), but reason being is that chess is a slow paced game that doesn't require much processing, besides checking if its a valid move. For this example in my opinion the safest bet is to do 1 thread per 10 players and 1-2 (yet again it depends on the size of the game and traffic) thread for server related, such as login, register, channel select, character select and such. That won't work because now, you'll be sacrificing CPU instead of RAM due to having to foreach the client processes inside each thread. Alright, so I made my adjustments as necessary and uploaded the changes to GitHub and Host-A! Just a simple update. Once again, if you find any issues, please let me know! if i wanted to get this thing running do i place the code under the create event for any obj? Pretty much, it's best to have a single object dedicated to handling all the networking on the client, it simplifies everything. You can really initiate the networking however you want. For example, you could have the client start the networking and connect to the server after the client hits enter or clicks a button on screen. Thanks for the great post i have small experience with C# and this was exactly what i was looking for. Glad you didn't use node.js. I was wondering if I wanted to host my game on amazon ec2 for example i need to place the url given by them in network_connect_raw and myIP (IP Address),in part 2 spoiler? In spoiler part 4 myEndPoint.Address & myEndPoint.Port can be used to get the ip and port. This means clients don't have to manually insert there ip correct? I should upload these classes to the server some how right? to write either the port or IP address of the client to the packets manually. The TCP and UDP systems do this themselves. Yes, all you need to do is provide the URL in place of the IP address in order to connect to your server hosted behind the URL. Assuming that Studio:HTML5 still doesn't support a lot of networking functions, has this been tested on HTML5? Would it work? For now you can however use networking on Android, iOS, Windows, Linux, etc. Literally everything but HTML5. So if I was able to put this in my game, I wouldn't have to do much but sync the objects using the GM:S client? One of the many GMC Gurus. Most likely unless you absolutely need major server side processing. Usually everything can be done client side except for things like registry, log in and payment verification if you actually were to use any of that. necessary for your game to function. Edited by FatalSleep, 03 June 2014 - 03:00 PM. Could you combine with Protobuff or JSON? Edited by autukill, 05 June 2014 - 02:01 AM. I'll look into it, I've never used either, so we'll have to see. This is a really useful guide, was looking for something just like this. Thanks man! It does not work in HTML5, right? Will guide, how to use the network in HTML5? I want to write a game online, but so far it only connected with MySql, but this is only database. I definitely need a server for other calculations, fielding timers etc. Edited by AcTiViSioN, 18 June 2014 - 01:53 PM. Well the server itself is Windows based, so it can't be used as a web application. However this isn't an issue, this is normal for servers. The CLIENT should be HTML5 though, if that's your focus. However, GMS does not currently support web sockets at the moment. I can not connect 'host-a.net' page. Can you give me the another link? I have migrated the links to Dropbox from Host-A, check the main post again for the download. Good! As I see it, this source & class's function is very useful. I was to save time to create similar to it. Thanks to you. Edited by wnsrn3436, 30 June 2014 - 09:17 AM. No problem, I am all about saving time, especially with networking! I am glad it's helping people, literally took a month of on and off working on it to finish it. literally perfectly fits with GMS for networking purposes, took ages to test out the bugs lol. I found with the c# server open and open the client, the client never draws. But without a window to close it gets stuck in memory. doing something to cause the client to stop working. a bit more specific for me to be able to help. Well I was just using the Client in your networking tutorial so I can see this all working. The hanging is like it is chatting between the server and client so much that it never gets to the part to draw the gamemaker window. But like I said the server does indeed see it connected, and the CPU use is 10% for the gamemaker client. Edited by n0997, 12 July 2014 - 12:01 AM. even at sending 60 packets per second or maybe even more. The issue could be on your end with GML? it if possible and reconnect. Edited by FatalSleep, 12 July 2014 - 12:35 AM. 192.168.1.2 Is the IP of the computer I am running both server and client on. 192.168.1.1 Is my default gateway. Your time is appreciated, I am trying to understand this process for a community game we are creating, using gamemaker will speed up the development of the client 100%. But we need c# processing speeds on the server side, so your solution is going to be best for us I think. Well not sure what I did but its working now... on both raw and not raw. Thanks for this .. its a great first step for me. Edited by n0997, 21 July 2014 - 11:07 PM. this is a great tutorial, I've understand a bit how the server and client work... But I've some problem on C# server, yes I'm noob and I want learn more about this! 1. Why does "MyEndPoint" not work on TcpPacketRead? And Thank you for this wonderful Tutorial! Edited by Chinafreak, 23 August 2014 - 11:48 AM. +1 for helping bring them to light. The issue is that you're using "MyEndPoint" not "myIPEndPoint" which is the variable name for the EndPoint of the function! The IP info is all related to the client's EndPoint, this is "myIPEndPoint.Port" and "myIPEndPoint.Address" in the EndPoint. the message. However, it gets a bit difficult to had in conditional situations. E.g. send to client with socket ID of X, Y and Z..
what it looks like, that is what I was going for, and I feel terrible about it now. As for #3, the issue could be that you're flooding the network with messages because the TcpPacketSend() method runs constantly. of messages a second and not realizing. ... Please forgive me here, I'll rewrite the system base and should have it up in about a week or so. Don't get me wrong, there isn't really nay issues with the current system, it's simply missing some... major features. Edited by FatalSleep, 23 August 2014 - 01:01 PM. walk-through and everything you might need to get going again. Edited by FatalSleep, 28 August 2014 - 06:33 PM. Update released! Please read the main post for more information! 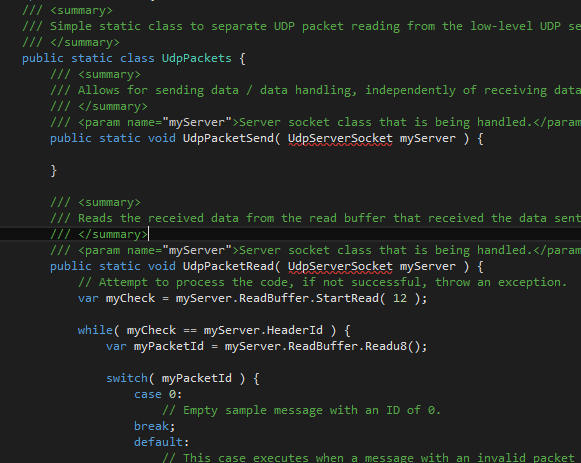 I think, you forget to add UdpServerSocket on UdpNetwork. My currently GUI Server is working on Box2D (I know, this is not nice, but I need Box2D calculations. For a good reason), so how can I teach the server that also expects calculation exactly from GM:S Box2D? Sorry for the noob questions. Hurr. Edited by Chinafreak, 04 September 2014 - 02:42 PM. My apologies, looks like you're using the GitHub Repository, which has the issue. and here is a quick link to it for convenience! cannot help in that field. My apologies!